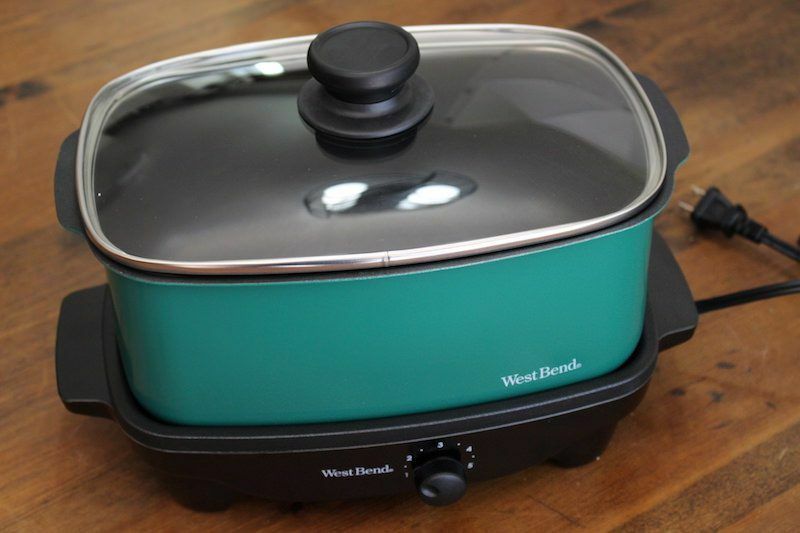 West Bend Versatility 5-Quart Slow Cooker Review . Most slow cookers are the standard oval stoneware, but the West Best Versatility is made of non-stick aluminum. This has a number of advantages and disadvantages which I'll talk about below. 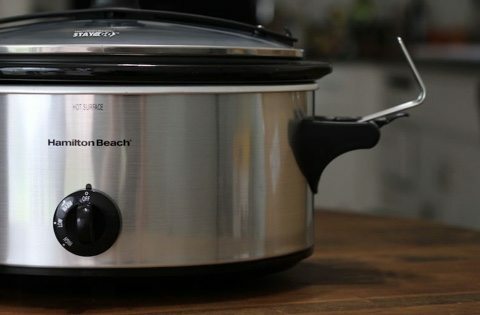 I have some comments about the design and tote bag as well, so be sure to keep reading if you think this could be the best slow cooker for your kitchen. 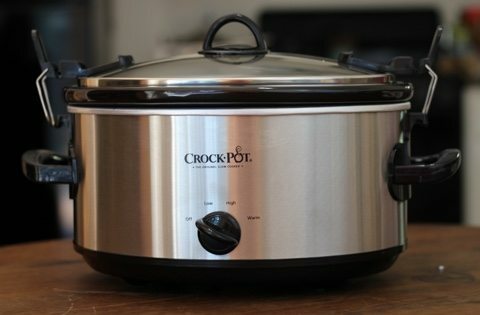 The recipe I made for this cooker turned out quite tasty, so overall I'm happy with the way it worked and think it's a good buy for the money you pay. That being said, it's not my favorite out of the 5-6 quart models I've reviewed, and I'll talk about alternatives below as well. 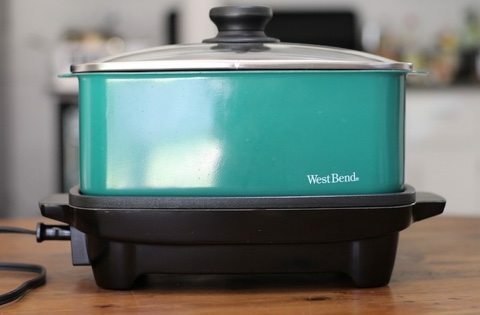 Actually, the West Bend Versatility 5-quart model 84915G is pretty unique. It does the typical functions of a slow cooker, but it's labeled a little differently. For example, the dial does not feature typical high, low, warm settings. Instead, you see the numbers 1-5. After a bit of digging, I found that common sense was correct. 1 represents warm, 2/3 represent low, and 4/5 represent high. However, what makes things a bit complicated or at least hard to calculate temperate and cooking time is that the numbers don't “click” in place. The dial is fluid, so you can set the temperature at 2.5, or 3.75. While this may be convenient for dialing in a recipe to exact specifications, it can make repeatability difficult. Are you sure the dial is on 3 or is it 3.12? Will you remember how you set the dial on that time dinner turned out extra good? There are also no heat-resistant carrying handles, which is a bummer. Although the cooking vessel doesn't get piping hot, it does get warm enough that I prefer to use heat resistant handles. The handles are also very small, making it tempting to carry the dish by the bottom cooker part, but then that means it may be possible to tip the whole thing over. So I wasn't too hot on the functionality of the design. I did like that there was no rubber seal around the lid, and that the non-stick pan is dishwasher safe. However, if you plan to wash in the dishwasher, just be aware that the non-stick will lose its effectiveness faster. 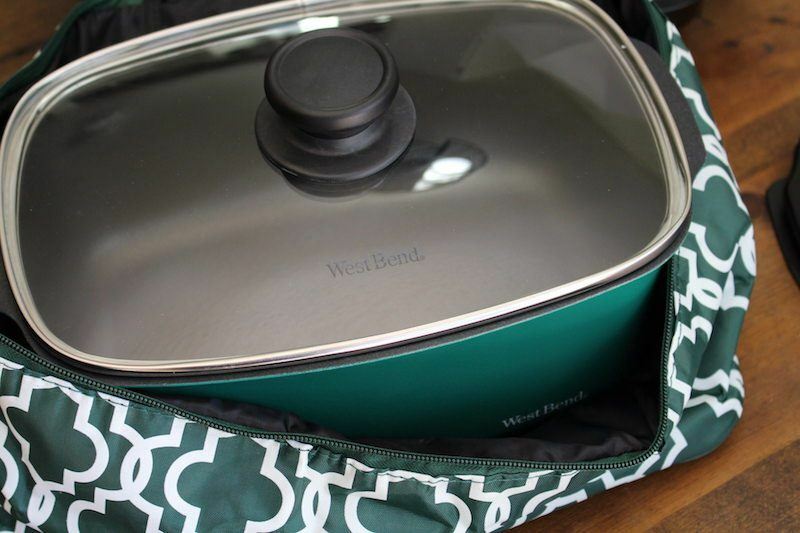 One of the main appeals of choosing this model of West Bend 5-Quart Versatility is that it's made of lightweight aluminum. This means carrying the dish around much easier. It does come with a plastic snap-on lid to prevent spills, as well as a free tote bag. Yes! 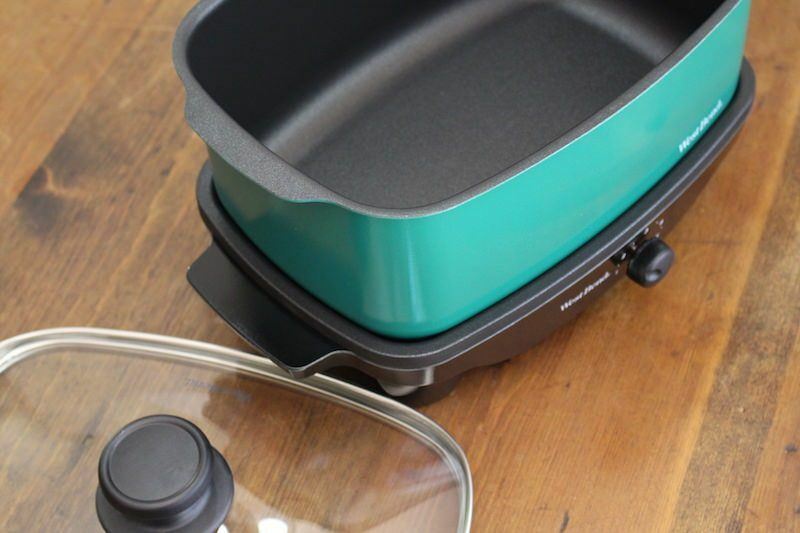 A free, color matching tote-bag is included (the cooker comes in 3 colors red/blue/green). For me, personally, I can't imagine doing a lot of running around with a pot of food in my car, but it must be pretty common because many slow cookers have lid-locking clips. 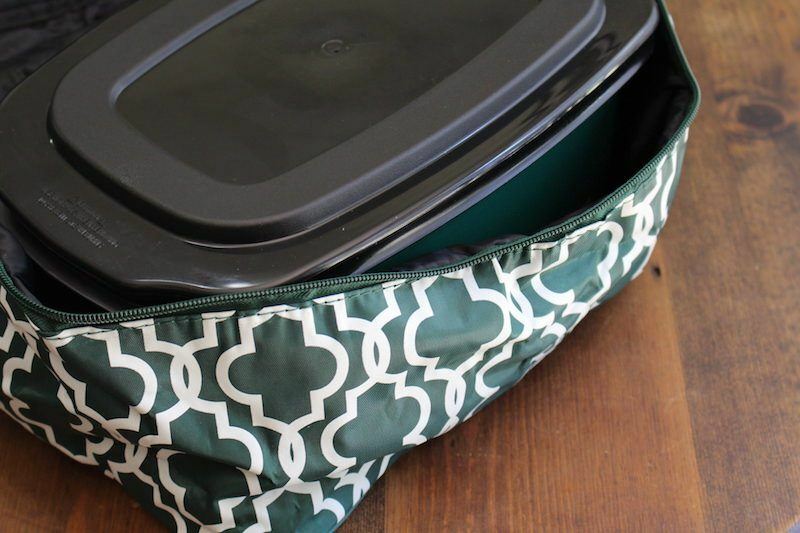 If you'd rather have a plastic snap-on lid than the traditional lid-locking clips like you see on the Crock-Pot Cook-N-Carry or the Hamilton Beach Stay-Or-Go then the Versatility is the best option for you. But did you know that this is one of the most versatile slow cookers you can buy for this price? Though it looks quite simple, you might be surprised to know how much this thing can do. I haven't tried the griddle capabilities yet, but would like to before I resell this one online. I'll be sure and post pics if I do get a chance to check that out. For the time being, I just used it as a slow cooker though, so keep reading to find out how it performed. Though this is a 5 quart slow cooker, I felt like it occupied much less counter space than even a 4 quart oval cooker with stoneware. Perhaps because the cooking is all done on the bottom of the pan rather than having an encased vessel for heating the pot on sides. Whatever the reason, I was able to stick this slow cooker away in a corner while my cinnamon apple pork roast with spiced ale was cooking. 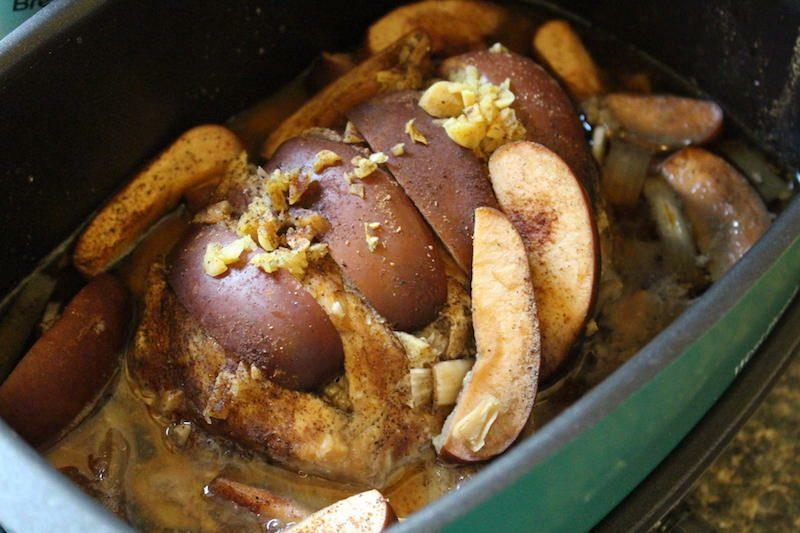 The meat in this recipe turned out delicious, so the cooker functioned just as needed! I was a bit concerned that the recipe wouldn't turn out properly due to the fact that all heat is coming from the bottom instead of all sides, but it was fine. The main advantage of choosing a cooker like this will be the light weight and smaller size. That makes it easy to fit in a small kitchen, even for a 5 quart device. If 5 quarts is still too big, you can see our reviews of smaller slow cookers, but in terms of size, the Versatility would fit easily in most kitchens. Another BIG difference between model 84915G and other cookers in this price range is going to be cleanup. Most other cookers make use of stoneware, so they are much easier to clean. They're dishwasher safe, and you can't damage the glaze by scrubbing to hard. With the non-stick aluminum you should always clean with a soft sponge, and you'll need to soak it overnight if anything gets really stuck on. However, stoneware also breaks! One crack from knocking it on the counter and you've got to buy a new pot. On the other hand, you can beat up an aluminum pot without any repercussions other than cosmetic ones. Did I mention how much would hurt to drop a soapy ceramic pot on your toe versus a thin-walled aluminum pot? 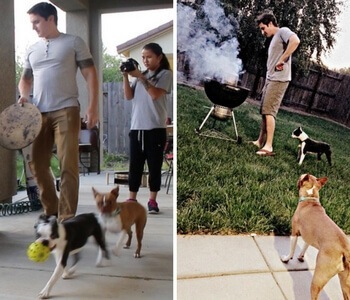 HUGE difference! 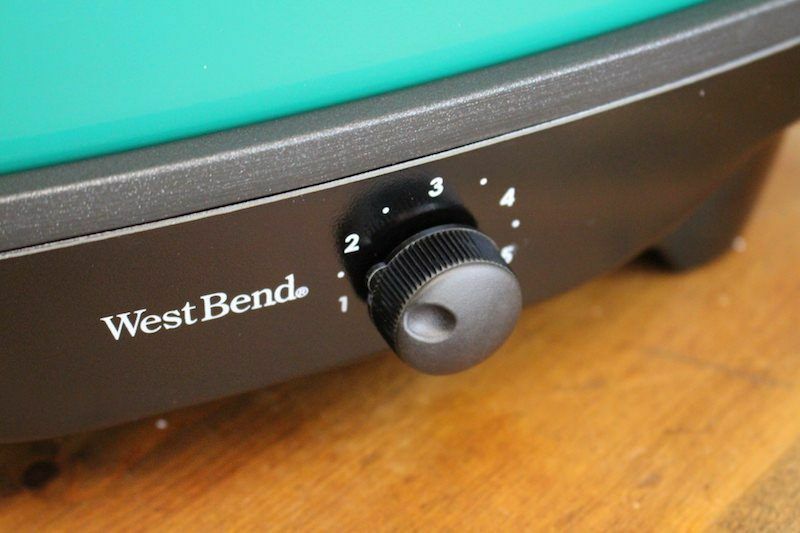 You're also need to consider that the non-stick of the West Bend Versatility is going to wear out over time. Even with good care, the non-stick just wears off. The same is not true of glazed stoneware which lasts forever with proper care. Lastly, you may be concerned that crock stoneware contains harmful lead in small amounts. This is not an issue since the glaze blocks any harmful substances coming from the clay, but some people like to play it safe and avoid products like that when they can. At the same time, consider that non-stick material is made with perfluorooctanoic acid which is a carcinogen, and can emit harmful compounds when heated too high. Overall, I prefer these other two models to the West Best Versatilty 5-quart, but do you agree? If you're going to decide to get the Versatilty, leave a comment letting us know why you chose that one! 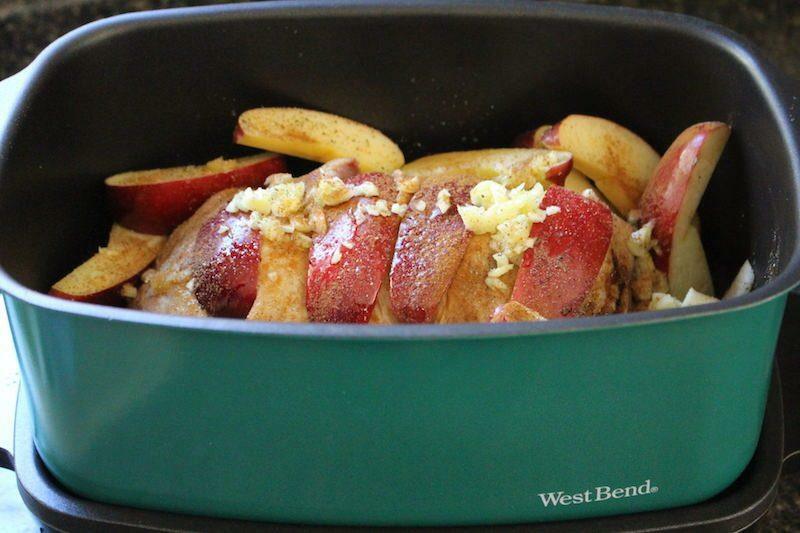 Who Is The West Bend Versatility 5-Quart Slow Cooker Best For? For someone that doesn't want to use stoneware, then choosing a non-stick material for their slow cooker is a great option. It can work just the same as any other type of material, and if you take care to wash it properly, it can last a long time. Want a free tote and plan on taking your meals on the go? This makes it a great option for you as well. The small size of the cooker despite it's 5 quart capacity makes it good buy for someone with a small kitchen as well. Finally, if you just want some fun colors in your kitchen rather than white/black/silver then the color options of red/green/blue will help spice up your kitchen design. Personally, I like the blue one, but the green one is the cheapest. ==> Get This Slow Cooker! I probably wouldn't buy or keep this one in my own kitchen because there were too many downsides, but it was a great cooker to use, and be sure to think about the pros and cons before deciding. I just prefer the oval stoneware and more famous brands of Hamilton Beach and Crock-Pot. ==> Get The West Bend Versatility 5 Quart!